Joanna Demers' research and teaching interests include popular and experimental music since 1945, philosophy and aesthetics, and electronica. 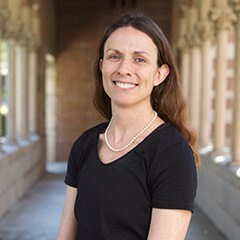 Joanna Demers is chair of Musicology at USC Thornton. She received a PhD in musicology (Princeton, 2002) and a DMA in contemporary flute performance (UC San Diego, 2002). Her teaching interests include popular and experimental music since 1945, philosophy, aesthetics, and electronic music. Prof. Demers writes both scholarly and creative works that explore philosophical issues in recent music. She has published two scholarly books: Listening Through the Noise: The Aesthetics of Experimental Electronic Music (Oxford University Press, 2010), and Steal This Music: How Intellectual Property Law Affects Musical Creativity (University of Georgia Press, 2006). She has also written two novels: Drone and Apocalypse: An Exhibit Catalog for the End of the World (Zero Books, 2015), and Anatomy of Thought-Fiction: CHS Report, 2214 (Zero Books, 2017). Her articles have appeared in Twentieth-Century Music, Organised Sound, Journal of Popular Music Studies, Current Musicology, and Popular Music. Her essays have been published in The Oxford Handbook of Sound and Image in Digital Media, Tomorrow Is the Question: New Directions in Experimental Music Studies, and Modernism and Copyright, as well as in Oxford’s Encyclopedia of Aesthetics. She also writes book reviews for the literary journal Full Stop. She has received grants and support from the American Association for University Women, the DAAD, and the Joseph Kerman Fund of the American Musicological Society. Her forthcoming projects include a novel on the disappearance of the American university, and a scholarly book on the louche in recent French pop. What is the greatest challenge or obstacle facing the field of musicology today? One formidable challenge is the same one facing the humanities at large, and probably the university at large as well: how to navigate between the need for a canon, and the legitimate desire to have diverse representation of styles, genres, and histories. This has at times taken a venal turn at some colleges and universities, where historical music surveys are being entirely replaced with buffet-style options catering to popular genres. Musicology can and must engage with pop, jazz, and non-Western genres, but it should do so with an eye toward a large-scale pedagogical goal, rather than simply filling seats. What drew you to teach at USC? Everything! The opportunity to pursue research at a top institution; the chance to teach and learn from professional musicians who are also students; the city of Los Angeles; and USC Thornton’s wealth of departments and programs. What is your favorite piece of music and why? It’s hard to choose, but I listen most often these days to ambient drone music. My favorite artist is Celer (Will Long). Everything he does is magical and his recent album, Climbing Formation, is just perfect – especially the final track. Why is it important for musicology students to learn about both classical and contemporary movements? We never question the idea that art history majors should know about both Warhol and Caravaggio. I believe in classical education in general — and by classical, I mean the thoughtful study of models, whether they be in literature, art, or music. There are abundant examples of classical models in pop and jazz, and any educated musician will want to know them as well as analogous models in classical music. How can performance majors benefit from the study of musicology? The textbook answer that folks in my line of work give is something along the lines of: “Musicology will give you the historical background that will produce a more informed performance.” That’s true — but it’s a stale answer, and not convincing to performers who, rightly so, need to spend hours in rehearsal and the practice room. So here’s a better answer: As one of the humanities, musicology teaches us how to engage with texts, how to contemplate music, history, and philosophy, and how to ask the right questions of the music we play and write. Why do we make music, anyway? Musicology studies cultivate an ability to draw connections between history and the philosophy of music-making, which is useful to any musician.